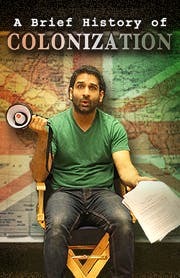 A one-man comedy show about a culturally conflicted British-Indian comedian who tries to make a Hollywood movie about India's colonial past, forcing him to revisit his own and discover the beauty of his heritage, despite what he has been led to believe about it by mainstream media. Starring Pacino! Walken! McConaughey! *Some actors may not be present.